On Oct. 13-19, I was in Amsterdam for the WorldSkills General Assembly (GA) and Global Conference, where more than 70 countries met. We were welcomed by the Netherlands commissioner of education at the first meeting. There were lots of great sessions from global experts on workforce development, training and career education. Scott Norman, our WorldSkills technical delegate, also attended along with Kieron Kohlmann, former automotive WorldSkills competitor and now a member of the WorldSkills Champions Trust representing the United States and the Americas. Kieron now works in management in the automotive industry in Michigan and was part of the team managing the World Youth Forum (occurring simultaneously with the GA). We heard great reports on his work. The event was an incredible networking opportunity with some of our key partners. I met with Maureen Tholen from 3M to develop a strategy for an upcoming meeting in Washington, D.C., where she and I will be co-presenting to CEOs in the manufacturing industry. I also met with our friends from Lincoln Electric, the CEO of FESTO, and representatives of the American Welding Society. I also met with representatives from WorldSkills France and WorldSkills UK to talk about possible cooperation between our conferences. Amsterdam is a beautiful city full of canals, as it sits below sea level, and water is a major mode of transportation. It is also a city full of boats and bicycles. I learned that there are 1.5 bicycles for every person in the city of 900,000. From Oct. 21-23, SkillsUSA’s Office of Business Partnerships and Development held a successful inaugural Partner Summit in Las Vegas with 70 business partners attending. Summit presenters included: Tony Ambroza, chief brand officer at Carhartt Inc.; Maureen Tholen, the sustainability director for 3M and new SkillsUSA Foundation chairperson; Albert Smith Jr., a group vice president and chief social innovation officer for Toyota Motor North America; Rich Calvaruso, who leads the lean manufacturing transformation for GE Appliances, a Haier Company; Johnnie Garlington, senior manager for training for Toyota Motor North America; and Steve Hidden, Miller Electric’s national account manager for welding education and workforce development. Also speaking were our friends Robin Utz, chief for the College and Career Transitions branch in the Division of Academic and Technical Education for the Office of Career, Technical, and Adult Education at the U.S. Department of Education; and Richard Katt, an expert in career and technical education. 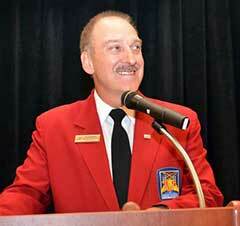 I gave remarks on SkillsUSA’s future direction and strategy at the welcome dinner on Oct. 21 and breakfast on Oct. 22. Staff members Gayle Silvey, Dave Worden, Amy Serafino, Dave Worden and Kelly Horton spoke or facilitated sessions. Staff members Taryn Zeigler, Shelly Coates, Kaitlin Youngs, Eric Gearhart, Heidi Walsh, Dave Worden and Cathy Arrington also served as facilitators and handled logistics of the event. This was a great opportunity away from the hectic nature of our National Leadership and Skills Conference to discuss ways to expand and enrich strategic relationships for the benefit of our partners and SkillsUSA. Congratulations to our staff who worked hard to make the summit a stellar event for our partners. I believe we will see higher levels of business support as a result of this meeting. To see the SkillsUSA FY18 public relations report, media report from NLSC, recent press releases and other stories, go to: www.skillsusa.org/publications-news/press-room/. Staff member Gene Dudley has developed a Perkins V workshop. Staff is formulating a strategy to ensure that SkillsUSA is part of the Perkins transition plans that state agencies will file in April 2019. Over the next decade, 2 million manufacturing jobs will go unfilled due to the skills gap. With the help of teachers, we can mitigate this gap and show students the reality of modern manufacturing. The Manufacturing Institute’s “Dream It, Do It” toolkit at http://tinyurl.com/gnmdgkd provides teachers with activities to expand students’ knowledge and awareness of the manufacturing industry. Many people of all ages are amazed to learn how much is manufactured in the United States and how diverse the careers are in this industry. Today’s manufacturing is about new innovation, making an impact and a chance to design and build the future. Whether students are interested in design, engineering or even the business side of the industry, there is a place for everyone in manufacturing. Not only does the industry offer a wide variety of demanding and fulfilling roles, it also offers high pay and opportunity for career advancement. Help the WorldSkills USA Team! SkillsUSA has fielded the 2019 WorldSkills USA team, with 23 competitors heading to Kazan, Russia, to compete in 21 skill categories including a demonstration event in Cyber Security. There are 22 experts plus SkillsUSA staff advising and supporting this team, and the 45th biennial event will be held Aug. 22-27, 2019. Check out the new press room on the microsite here: www.WorldSkillsUSA.org. We are working hard to increase public relations and awareness for the 2019 WorldSkills USA team. Our official WorldSkills USA social media channels have launched, and we want to ensure that we are building followers for the team. We encourage you to visit each of the following links and click on “subscribe,” “like” or “follow” so you don’t miss our updates. Please also create a YouTube account, if you don’t already have one, so you can subscribe for video updates. Please join us for #GivingTuesday between now and November 27. Giving Tuesday is a way to make a huge impact on building our future workforce. Any donation made to SkillsUSA will be generously matched by our partners at CareerSafe. To donate, visit: http://bit.ly/2DjSETo. Please follow and share SkillsUSA social media to help spread the word.